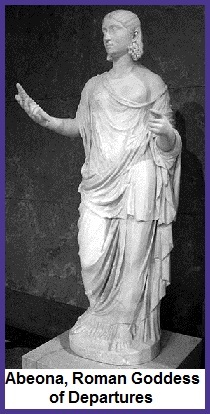 Abeona is a goddess of Ancient Rome. Her name comes from the Latin verb abeo, “to depart, go away, or go forth”. She was believed to especially guard children as they took their first steps away from home to explore the world. Goddess Abeona supports us as we break out of our comfort zone and enter into new levels of independence, self-discovery and personal responsibility, which concurs with the added meaning of abeo, ”to die, disappear, or be changed”. In the Goddess Inspiration Oracle Guide, author Kris Waldherr writes, “In the eyes of the universe, we are all children. Whenever we start something new, it is as if we are learning to walk for the first time. We may stumble initially. But if we persist, we will discover new vistas beyond what we originally expected”. I am new at studying these feminine deities and with each one they quickly become one of my favorites. I love that Abeona is also known for protecting travelers. It is very reassuring to me, knowing she will be watching over me throughout any of my future travels and adventures.